Sign up below to receive our email newsletter. Just enter your email in the form beneath "Sign up for exclusive offers & sales" and click "Join." Each issue contains sale announcements, special values, new product announcements, and ergonomic information, all designed to help you, or your employees or clients, work in comfort. Subscribers receive notice of sales and subscriber-only coupons. Our newsletter is sent out monthly, though you will occasionally get a special edition email notifying you of short-term manufacturer specials or contests. You can unsubscribe at any time, and we do not sell or give your information to anyone. Ever. 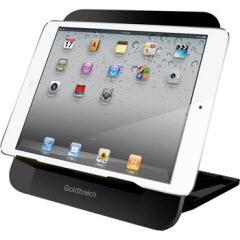 New subscribers are entered into a quarterly contest to win a Goldtouch Go! Travel Notebook and Tablet Stand ($39 value, iPad not included).